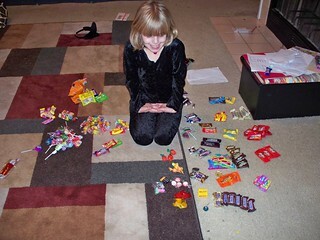 Most of the Halloweens I can remember while growing up had two things in common: the day was always cold and rainy, and it ended with my brothers and I spreading our respective candy stashes on the floor, sorting out our favorite treats and trading the others among ourselves. For millions of kids (OK, adults, too), candy is certainly the sweetest aspect about this holiday. Unfortunately, these delicious treats can spell disaster for our cats, so it’s important for us to take some simple precautions to make sure everyone in our household – pets included – have a safe holiday. I know, I know, most of us are familiar with the basics when it comes to candy and cats. Chocolate can kill a pet, yada, yada. Not to mention that cats don’t have much of a sweet tooth. So the reason they’d go after a piece of candy is likely to be far different from why you or I would. The trouble comes when a rogue M&M falls to the floor and your cat thinks it’s a treat. Or perhaps the noise of a cellophane-wrapped candy intrigues your cat who proceeds to swat and carry it all around your house. Moments like that can lead to trouble. Well, as we know, chocolate is toxic to cats. What you may not know is that the toxic agent is called theobromine, and it’s in all types of chocolate. While most cats won’t eat chocolate on their own, they may be tricked into eating some if it’s presented as a treat. Unfortunately, theobromine causes a number of serious conditions including abnormal heart rhythm, tremors, seizures and, of course, death. Meanwhile, other candies and gum can be just as dangerous. Some of those treats are sweetened with xylitol, which increases the amount of insulin circulating in your cat’s body. This can cause your cat’s blood sugar to drop. Xylitol can also cause liver failure. Common symptoms include seizures (soon after eating something with xylitol in it), and liver failure (after a few days). Even if a candy doesn’t contain theobromine or xylitol, it can still be dangerous to your cat. Chewy candy can get stuck in their mouths. Hard candies can get lodged in their throat, leading to choking. And that’s not all. Wrappers aren’t necessarily safe. They may have candy residue on them that your cat could lick off and ingest. If the wrapper is ingested, it can cause choking or create a blockage. I know this post puts a bit of a damper on what could be your favorite holiday, but think about it this way – you’ll enjoy the day so much more knowing your pets are safe, than if you have to spend it in a vet’s emergency room. And simple precautions are all it takes to be safe. For example, make sure your treat bowl stays out of your cat’s reach. If your cat can somehow get to the bowl, consider placing a lid on it, or putting it in another type of container. If you have children who go trick-or-treating, have a conversation with them about how it’s not safe to give your pets a piece of candy, even though they may want to share. If your child tends to keep things out or lying around, you may want to set up a few ground rules, like your child can only have a piece of candy after lunch or dinner, when you can supervise. 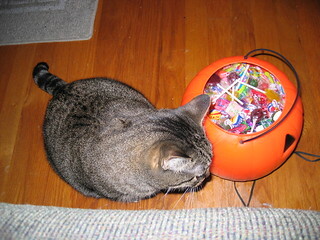 That way there will be less of a risk that your cat gets ahold of any candy. And, if your child is anything like me, or the child in the top photo, allow them to check out their bounty. Just make sure your cat doesn’t run off with a piece! Looking for more Halloween safety advice? Read more ways to keep your cat safe on Halloween. ← Which States Adopt Out The Most CH Cats?